Our customers are our family and we strive to provide every single one of them with the highest quality of service and equipment available. Although we are locally owned and operated, we are able to provide the most current information and new cutting edge technology in the industry. Our prices and customer service rivals that of any of the "big named" security companies in the market today. Our security and automation equipment are manufactured by the top names in the industry and our nationally rated UL listed monitoring station is based and operated within the United States. We offer FREE, no obligation consultations that leaves you the customer to evaluate your options on your own time. Call us, a company and family that cares. "Indiana Alarm installed the security systems in our main facility and outside warehouse. Everything from the quoting to the install was executed promptly and professionally. Customer service is very responsive, and all technicians have been great to work with on all issues. Indiana Alarm is a Class A organization." "Indiana Alarm shines above the rest! Amazing customer service. Absolutely transparent and no gimmicks pricing. Technicians are experts at their trade and don't cut any corners or time during set up. I would highly recommend Indiana Alarm to anyone! Thank you!" "Absolutely a great experience. Between the estimator and installers we had nothing but sequence and a job well done. We've used him for not away our business but also personally for our residents and many of our employees residence as well." "I was very happy with the service I received. The install prices were a bit higher than the big name companies, but the monthly monitoring rate was much less. 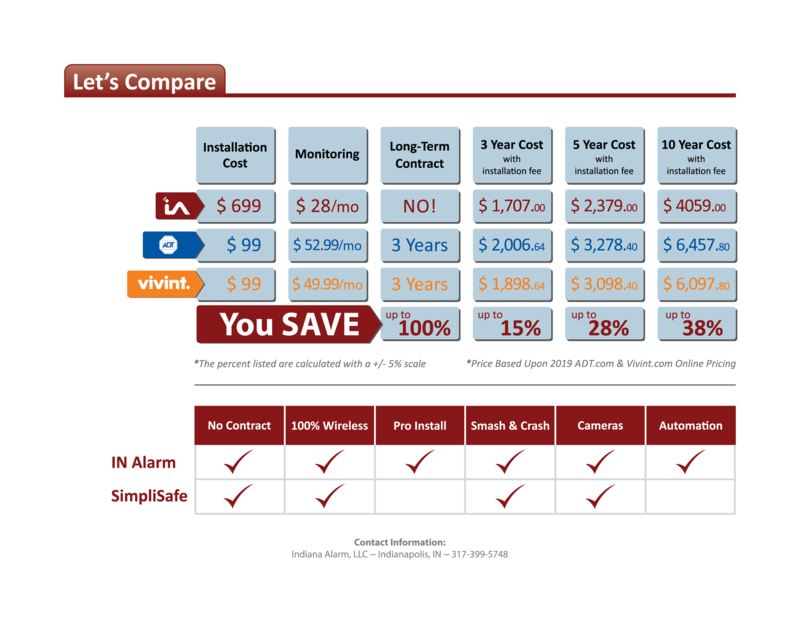 The team at Indiana Alarm was easy to work with and explained all the features very well. I am happy to support a local business and would recommend them to others!"